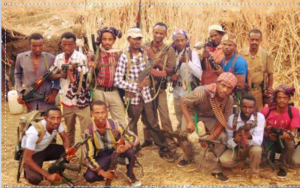 Ogaden News Agency (ONA) – Ethiopia: Armed groups vow to fight regime as one force. Ethiopia: Armed groups vow to fight regime as one force. Armed groups in northern Ethiopia have announced that they have decided to merge their forces in a bid to hasten demise of the tyrannical TPLF regime. Representatives of the armed groups disclosed to ESAT that two groups, namely North Gondar Ethiopia and South Gondar Tewodros with a total of about 450 fighters, have finalized their merger on Monday. Leaders of the armed group also told ESAT that their forces will also work in collaboration and seek the support of Patriotic Ginbot 7, an armed group that is fighting regime forces in the country. In a related development, witnesses told ESAT that armed groups have continued their offensive against regime forces in north Gondar. Fighting has continued in Abderafi, Kafta and Humera, while in Sanja the forced attacked and burnt a truck belonging to the business empire of the regime.